The sunlight at 22 degrees south latitude, interesting… has a certain feeling at 1030 in the morning, 210113, January, summer in the Southern Hemisphere. It snowed here in La Paz, four days ago. This is 'summer' at 3700mts. / 12,000ft. ASL. It's been raining just about everyday, but the other day the rain turned into some snow with accumulation. Of course, it was gone in several hours, but nonetheless, snow in what's equivalent to the month of July in the Northern Hemisphere. We're on the same time as New York City, Eastern Standard Time, or some such, as I think Daylight Saving Time here in Bolivia, -4GMT. It's a little crazy about time here, as the three countries I've so far visited (Chile, Peru, and now Bolivia), they're all on different times. South America needs to become more united! New York City and La Paz, similar in many ways as huge commercial centers. One on an island, the other tucked into a canyon of the Cordillera Real (a part of the Andes). Majestic snow-topped peaks frame this Capitol (Sucre the first). 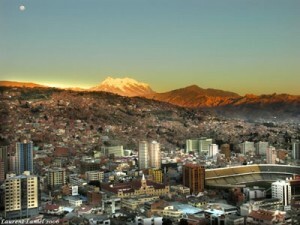 This city, La Paz, it has some of the most interesting terrain, and right a part of humanity. They contrast each other, one straight and square, the other one irregularly nonconforming. There are these 'stalagmite-cite creatures,' vertical columns of brown, with deep crevices between. These aping the 'Valle de Luna,' a few kilometers south of the Zona de Calacoto. I haven't been to this 'Valle de Luna,' but I have been to the one in the Atacama Desert, Chile. Juxtaposed with what humanity has done (concrete and red brick), they combine to make interesting vistas. I get to observe riding in a taxi, as we go down and down, round and round, the housing getting more expensive the further south we go (from San Pedro). It's fascinating to me, to discover some City completely different than all the ones I've been through (cycling the world in the last seven years). Oh, Catholic Church, what have your wrought, our undoing… Now, by the way, the Chinese are considering rescinding the 'One-Child Per Family' law. It wasn't working anyway, the Han felt discriminated against, as the 56 Ethnic groups could continue to have as many children as they could. So, the Han would bribe local officials and they'd turn their heads. I sit inside Sucre Plaza (nee park), two blocks from Namas.Te (where I'm living). On the south side of the Plaza, the infamous La Paz Prison. Already I've been hustled for M. / 12,On the west side a fancy hotel. I watch the world rush by… I'm part of the 'old folks' crowd, most immobile, and/or asleep. I bask in any sunlight, as starved for such rays!